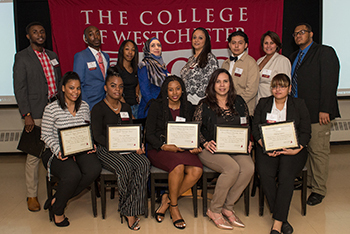 The College of Westchester Charitable Foundation (CWCF) hosted its 10th Annual Scholarship Fundraiser, honoring 13 scholarship recipients. This year’s event was especially gratifying with the announcement of two new grants awarded to the foundation by Sterling National Bank Charitable Foundation and Entergy. Marissa Weidner, Co-President of the CWCF Charitable Foundation, and Lucy Amicucci of Sterling National Bank Charitable Foundation made the announcement for Sterling National Bank and presented the check. Attendees included family and friends of the scholarship recipients, CW faculty and staff, CWCF board members and former Mayor Joseph Delfino presented the scholarship in his name. “The CW community is very grateful to all who donate and for these two new grants. We pride ourselves on remaining focused on students and their desire to graduate and obtain or improve upon their current employment situation. The funds raised through the CWCF allow the CW Scholars to supplement their available funds with scholarships thanks to the generosity of so many,” said Mary Beth Del Balzo, President of The College of Westchester.